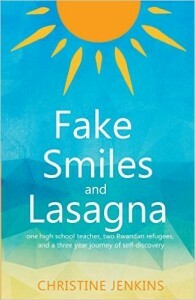 In Fake Smiles and Lasagna, author Christine Jenkins, a math teacher at Moses Brown School, describes mentoring sibling refugees from Rwanda and helping them get accustomed to the United States. This is Jenkins’ coming-of-age story — a middle-aged high school teacher who embarks on an incredible three-year journey. The idea to become a refugee mentor came about after a family movie night. Lost Boys of Sudan led to a discussion about how refugees continue to struggle once they come to the United States. This led to a eureka moment of what their next volunteering venture should be. Some online research led her family to the Rhode Island International Institute Refugee Resettlement Program, which opened the doors to them meeting Sonia and Eugene, teenage siblings from Rwanda who spent years in refugee camps after the death of their parents. Their aunt arranged for them to come to the United States. The United States didn’t live up to the Utopian images that Sonia and Eugene had in their minds, and building a relationship with two foreign strangers wasn’t as easy as Jenkins anticipated. Being a teacher with summers off, Jenkins was there for Sonia and Eugene for their first few months in the country. She helped them acquire household items and advocated for them when needed, helping them fill out applications and get into school. Sonia and Eugene were taken on family trips to WaterFire, bowling and Cape Cod (Jenkins’ sanctuary). Slowly but surely, they built a rapport. Jenkins and Sonia developed a strong and obvious bond. Eugene, however, is harder to read, but writes emails that make it apparent that he enjoys her company and appreciates what she does for him. Sonia and Eugene made great strides during the three years Jenkins writes about, but Fake Smiles and Lasagna really focuses on her life, her struggles and her accomplishments. She has realistic ups and downs that everyone goes through, and she writes with such humanity that you can’t help but be glued to every word. Jenkins is relatable, having an honest prose that showcases her second guesses and psychoses. She doesn’t hold anything back, truly opening the doors to her family, her thoughts and her life — both the positive and the negative. By the end of the book, I felt like a part of the family. Jenkins writes so descriptively that I felt I knew everyone in her life. I was disappointed to learn that, for confidentiality, some characters were composites of people she knew. That made my heart sink a little and became my only complaint about the book. I wish she had disclosed this in the beginning. That minor objection aside, I found Fake Smiles and Lasagna to be a fantastic read that gave a clear picture of a three-year span of someone’s life. Interestingly enough, Jenkins set things up for a sequel, as the epilogue has the family meeting a friendly refugee named Kito. I would be intrigued to see how that experience went and how it compares to the experience with Sonia and Eugene.